SCRAP-LOVE: A new Art Journal page. 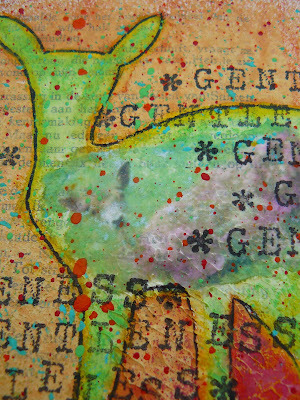 A new Art Journal page. Finished a new Art Journal page already 2 days ago. 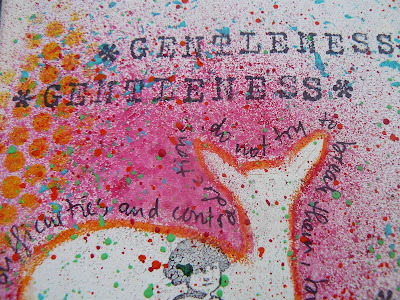 I'm still working with the Deer motif and the word gentleness. I suppose it's my theme for this particular moment in my life! When I went for a walk yesterday afternoon I saw one deer in a secluded meadow. 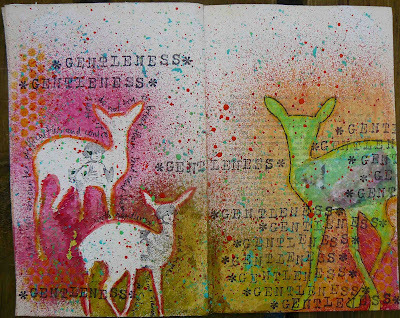 I must be making progress in being more gentle with myself, because it was only one deer and not 2 or 3 as it has been the case in the past! ;-) The deer was looking at me for a long time (and I was looking at her). I think there was a distance between the 2 of us about only 15-20 meters. When I started to move she just calmly turned around and disappeared into the bushes between 2 meadows. On this page I've worked with several layers (about 11). I also made a gel transfer with an ink jet copy of a deer in a green meadow. The journaling is a quote from Saint Francis de Sales and says: When you encounter difficulties and contradictions, do not try to break them, but bend them with gentleness and time. Sometimes it's better to do nothing and just wait and see how things are evolving!! Yesterday I had a splitting headache. I'm having my period and the last couple of times I noticed that I always have a splitting headache on the second or third day of my period. I think it must be caused by the menopause hormones! I'm still very regular though and I'm not noticing any other inconveniences, so I'm just fine with having a headache once a month. It is just for one day!! Because of the headache I wasn't in the mood of working on a new page for my Art Journal, but I did some preliminary work: I just glued all the pages of the book I chose to be my first Art Journal and made several sections of 5 pages (10 book pages glued together). I also want to gesso all of these pages so that I don't have to wait whenever I feel inspired!! your blog is very inspiring! I will be back for sure! your work is amazing. Love it. 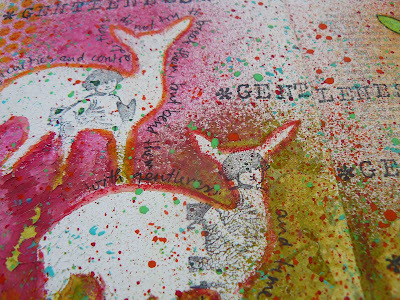 googling art journal pages, and found this, I love love love it!!! !